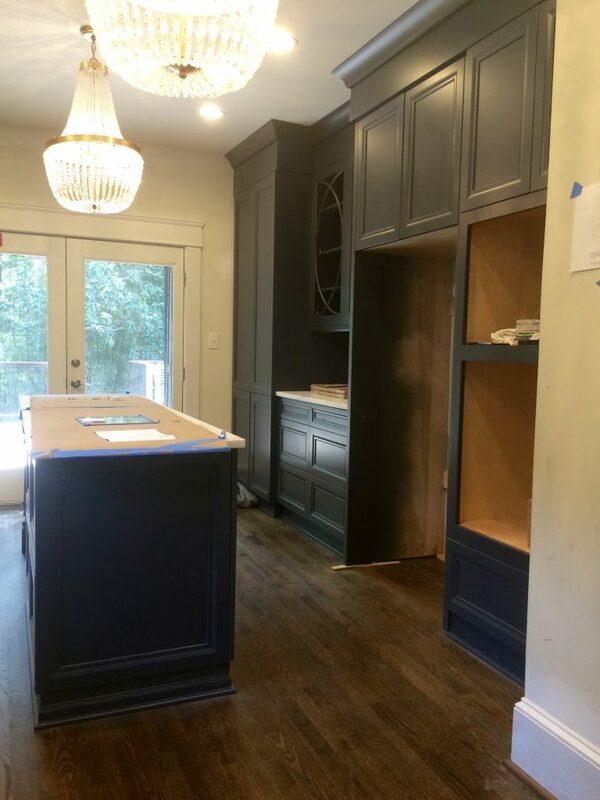 Our latest kitchen remodel features blue cabinets. Those who have longed to add a more personalized layer to their kitchen through their built-ins have finally reached the intersection of technology and trend to make their dream kitchen come true. Cabinets as we know them today originally started out as simple, stained wood. When paint was introduced as a finish option, the paint did not adhere properly and the finish would lose integrity quickly with use. Slowly materials progressed to add the level of customization that people craved through foils, laminates, or better-formulated paints but still the quality reduced after a few years of use. Fast forward to 7-10 years ago (depending on what part of the country you were in), the clean traditional trend staked a claim in almost every kitchen. The bright, white kitchens in simple shaker style cabinets became all we could see on home design shows and Pinterest. The great news is now color is back! Color is making its way back to interior design via trends in fashion (most design trends follow fashion). Just search “navy kitchen” on Pinterest and you see beautiful kitchens still keeping that clean & classic style that kitchens have adopted in the last decade. Magazines showcase bold and daring colors in every direction of a kitchen. 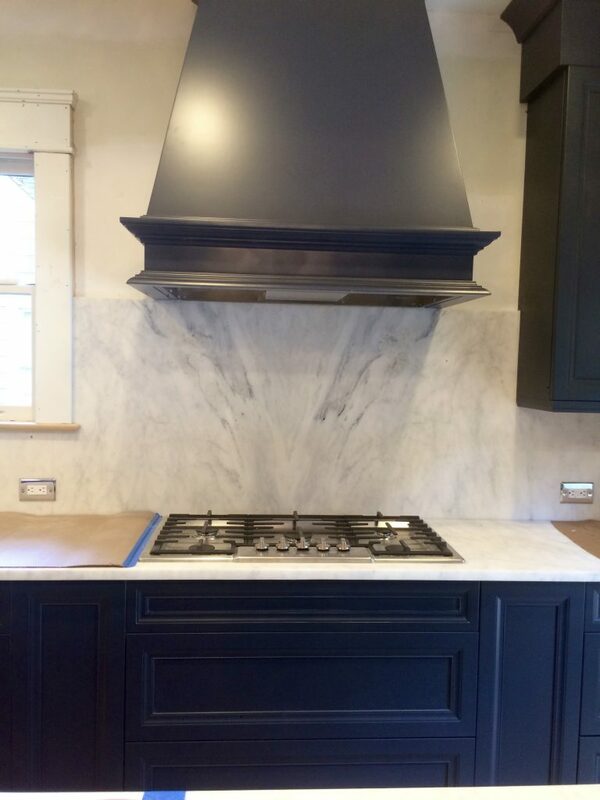 Even better news is that the glazing techniques from high quality cabinet manufacturers are able to last as long as you keep your kitchen – from neutral to bold. There are two schools to the colored cabinet: neutral backdrop or highly personalized. Though you may be a person who longs for color, the idea of being stuck with a color for years has made you shy away and you’ve made up your mind before talking to a designer. However, even colors can be neutral – by taking a color and “greying it down,” you can have a perfect, classic background while still leaving room for other “stand out” elements in the kitchen. Even a grey can have different undertones and be enhanced in other areas of the kitchen to accentuate the subtle differences in the color. And those who love the brightness of white, but are intrigued by a colored background, when a designer takes into account the whole picture they can add brightness through other elements of the kitchen. 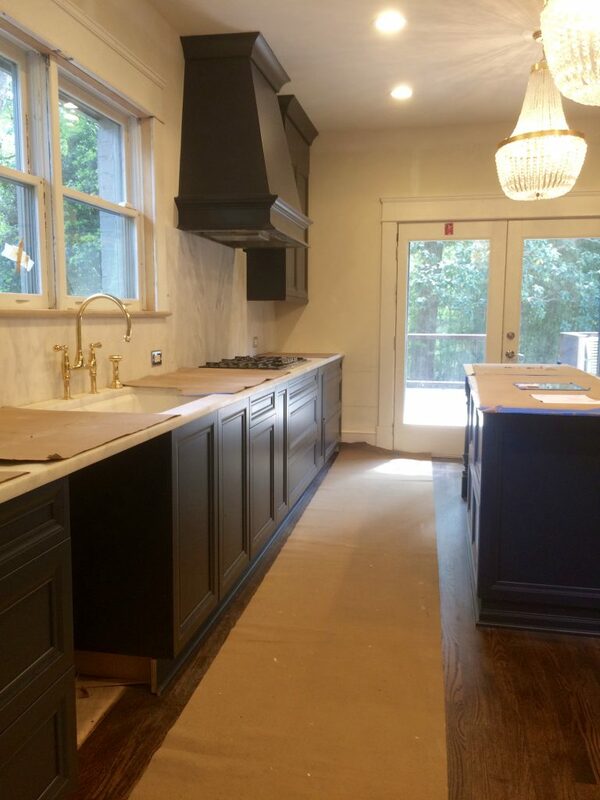 Here is a picture of one our current kitchen remodels in Atlanta. This blue is a custom color specifically made for our client; they named the color after her: Patience Blue. Another view of the kitchen nearing the end of completion. Though the cabinets are darker, they are still a neutral backdrop and are balanced with white marble and ample light to maintain a bright feel. On the other side of the cabinet “coin” are the highly-personalized, boldly colored cabinets. As stated before, the glazing techniques that are being used don’t have to mean compromised quality to get the perfect amount of personalization. Just like a neutral, when working with a designer they can balance out the colors for the built-ins or play them up through the rest of the design. You can be sure that the colors installed in your kitchen can be used to showcase your personal style in materials that can last as long as the house does. Color expertly introduced in your kitchen design will allow a guest to walk in and immediately get a sense of you. Besides wow-ing guests, want to know the best part of a personal design? You get to enjoy the most perfect place, perfectly made for you, every day.